There are several solid options for office productivity on iOS, including Apple's own suite of apps and Microsoft Office. 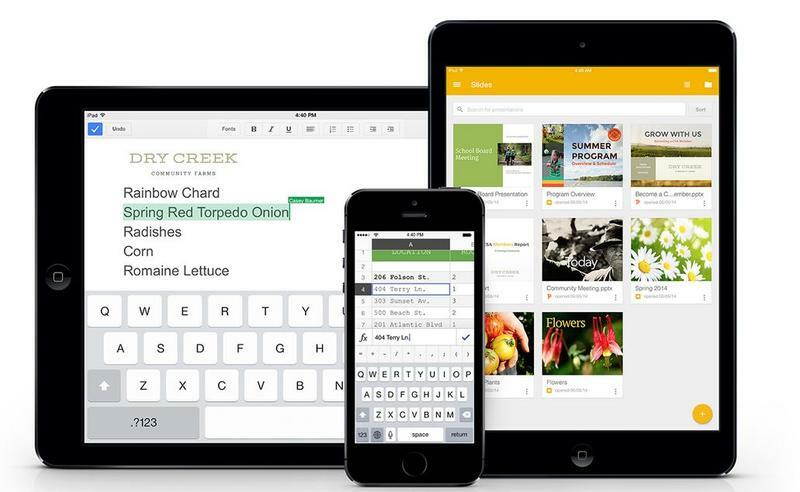 Google bolstered its efforts on Monday by releasing a Sheets for iOS and updating Docs and Sheets with new offline editing features. Slides, Google's own PowerPoint competitor, allows you to create presentations on-the-go, open, edit and save Microsoft PowerPoint files, work offline, format slides and even present a Slides file directly from your device. Additionally, it has added support for offline editing to the iOS versions of Docs and Sheets, which were already available to iOS users. "Any changes you make offline get automatically synced when you reconnect, just like when you make offline edits from your computer," Google software engineer Li-Wei Lee explained in a blog post. You can also now open and edit Office files right from your iOS device, an option that has already been available on Google's Android and Web apps. Google is certainly giving consumers another reason to use its software instead of paying for Microsoft Office 365, which provides free access to the iOS apps for that suite of software, and may even be giving Apple's own Pages, Numbers and Keynote apps a run for their money. You can grab the updated Docs and Sheets apps, in addition to the new Google Slides app, from the iTunes App Store now.